The Bengal cat is still a very young race. Different from other cat races, it did not evolve through selection or mutation but through crossing of different cat races with the Asiatic leopard cat (ALC, lat. Felis Prionailurus bengalensis). 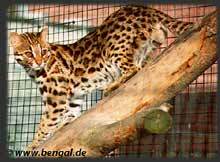 The Asiatic leopard cat is a little wild cat with an exceptional coat marking. Its circulation area reaches from Asia to Russia. Just as it can be found in the jungle of Thailand it can also be found in the deserts and semi-deserts of Mongolia. Biologist Jean Mill (Sudgen) crossed for research purposes for the first time in the sixties an ALC with a domestic cat. Fascinated by the result and animated by the desire to create a lovely, affectionate cat with the coat of a wild cat, she started a breeding program, in which she put all her knowledge as geneticist and materialized her vision through long and hard labor. However, the breeding of this new race turned out very difficult in the beginning as the first male F-Generations (Foundation-Generations) turned out to be sterile. We owe it to her commitment that we now have this wonderful cat with all of its attributes for which we love it and envy it so much. Jean Mill’s cattery „Millwood“ today still stands for highest quality and perfect type. We owe Jean Mill our deepest thanks and respect for having given this world one of the most beautiful cat races.